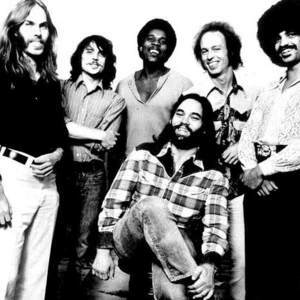 Little Feat is an American band who have mixed blues, R&B, country and rock and roll styles together since they formed in 1969 in Los Angeles, and are known for their eclectic blend of many forms of music. They were founded by the brilliant songwriter/singer Lowell George (who died in 1979), keyboardist Bill Payne, and drummer Richie Hayward (who passed away in 2010). The blend of California cool and New Orleans funk produced by George's slide guitar, Payne's virtuoso keyboards and Hayward's melodic and driving drums gave the George-era Little Feat a sound unique in rock and roll. Lowell George met Bill Payne when George was a member of Frank Zappa's Mothers of Invention. Payne had auditioned for the Mothers, but had not joined. They formed Little Feat along with former Mothers' bassist Roy Estrada and drummer Richie Hayward from George's previous band, the Factory. The name of the band came from a comment made by Mothers' drummer Jimmy Carl Black about Lowell's "little feet." The spelling of "feat" was an homage to The Beatles. Their first two albums received nearly universal critical acclaim, and "Willin'" became a standard, subsequently popularized by its inclusion on Linda Ronstadt's album Heart Like a Wheel. While touring in support of his solo album in June 1979, at the age of 34, George collapsed in his hotel room in Arlington, Virginia. The surviving members finished and released the Little Feat album "Down on the Farm" before disbanding. The surviving former members of Little Feat reformed in 1987 when Paul Barrere, Sam Clayton, Kenny Gradney, Richie Hayward and Bill Payne added songwriter/vocalist Craig Fuller, formerly from the band Pure Prairie League (who also provided some rhythm guitar), and Fred Tackett on guitar, mandolin and trumpet. With a seemingly constant tour schedule, Little Feat is easily one of the hardest-working and enduring bands in the industry today. With a history that spans more than 30 years, Little Feat is regarded by many rock music critics as a "band's band", and as one of the greatest rock bands in American rock music history. Best known for their combination of California rock and Dixie-inflected funk-boogie, they craftily blend folk, blues, rockabilly, country and jazz to create a unique style all their own, garnering a faithful grass-roots following. Simply put, Little Feat's sound transcends traditional music boundaries and they offer fans an unforgettable live performance. Richie Hayward became the second founding member of the band to die, passing from pneumonia and other complications of lung disease on August 18, 2010.